Installed a new and different kind of front cable stop on Schwinderella so that I can change brake lever types. Look for a comprehensive update to be posted later this week when completed. Also reassembled and polished the Davidson. It got packed up after Eroica without being cleaned, so it was quite a task. No damage, tho. 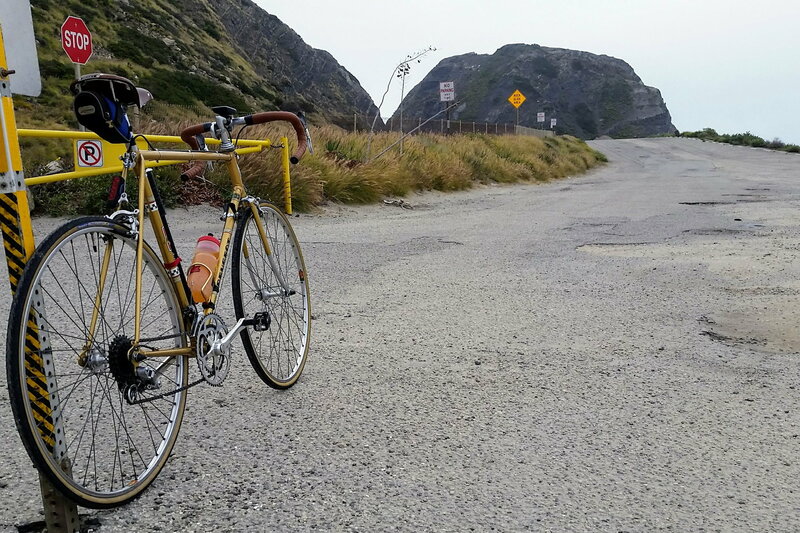 45 mile ride to Malibu and back on the '78 PR10. When I got home I saw I won an Ebay bid on a pair of Ballila brakes for a newly acquired Legnano GP. Never heard of Ballila before, but mine has a stripped screw that looks too short, and are pretty badly oxidized. Ebay ones look prettier, and have a release mechanism, so I hope they solve a couple of problems. 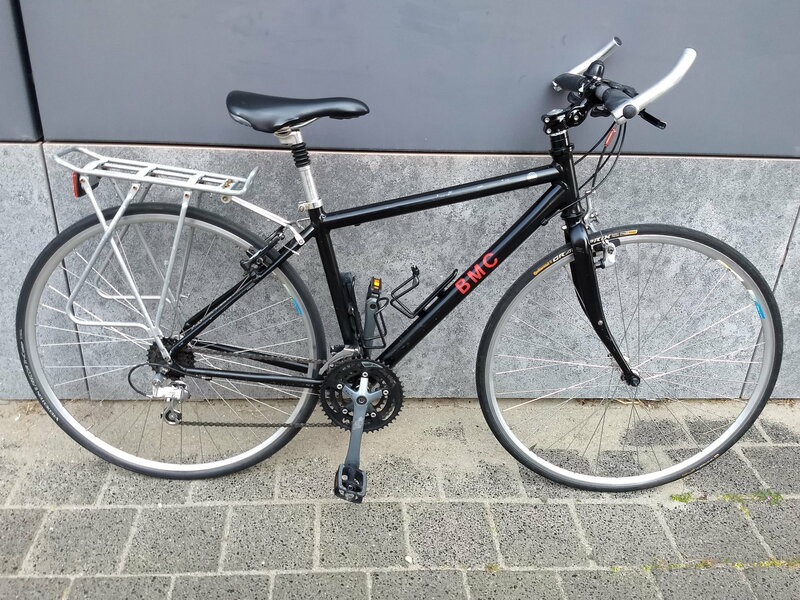 Completed converting my Davidson from a 2x10 dry weather bike to a 3x10, fendered, rain bike, complete with Shimano 6603 STI shifters, crankset, and 6600 long cage RD. The standardized chainring setup did not like a 26T small ring, nor a slightly used 39T middle ring in conjunction with 410mm chainstays. Back up to a pretty new 42T middle ring (even 10-speed specific, FWIW) and a 28T small ring. FD is dialed in and wasn't hard to set up. 12-27T cassette out back. VERY finicky! I would have really liked the entire chainring set to have been inboard another 2-3mm as I had the space. That would make the angle between the 27T cog and the 42T middle ring less extreme and prone to making the chain shift to the 24T cog when back pedaling. For now though, everybody is playing nice, pedaling forwards and backwards (well, backwards 95% of the time). This is the first time I've had issue with this sort of thing on a triple as generally I've run triples on longer wheelbase bikes. 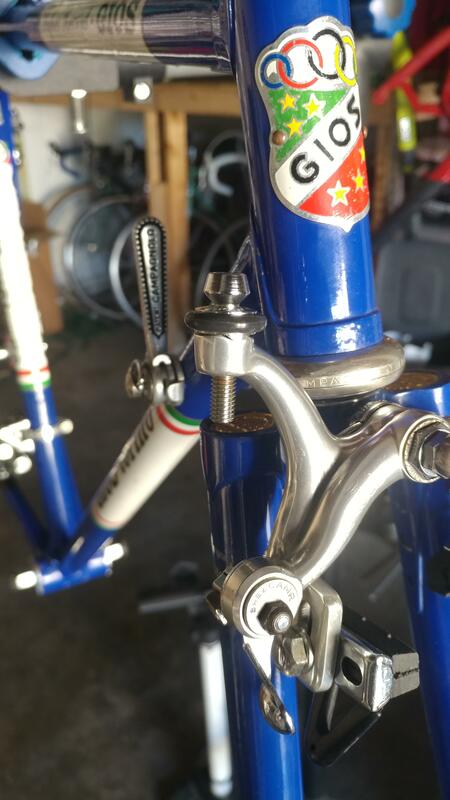 Though the triples that I have had that were fine on road/race geometry frames, were either fully Campagnolo, or full Campagnolo with a FSA carbon triple crankset. At least the fenders clear the 23mm tires easily. The bike also looks pretty good too, so I'm hoping that will carry the day after a long build process over the last two days. In other news, it's a tire re-shuffling, of which I have just two more to do. @Slightspeed, good stuff. And I love California scenery. I've been to various parts of the state and loved all of it. Balilla was around for a long time. 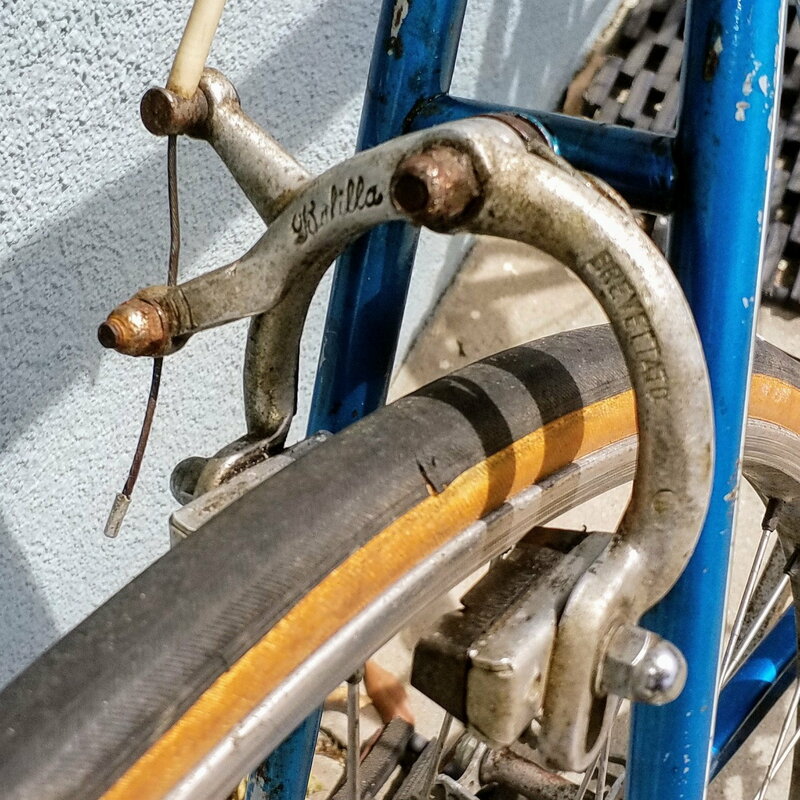 Some lower end Bottecchia bikes had Balilla center pull brakes. They looked too thin to work well, but I'm told they're fine. @non-fixie, I collect stems, too, so I can make adjustments. It's gotten out of hand. I might have two dozen stems now. And of course, they don't have removable faceplates, so making changes is labor intensive. Well, the upside is that stems don't take up much room. And instead of replacing the stem you can just build a new bike and address the other niggles at the same time. I'm afraid to ask how many bikes you have. I bet you don't even know. I'm fairly sure I'm pretty close to N. I think. Delivered this to a coworker today. She'd told me earlier she'd planned a multi-day tour to Belgium for the Easter weekend. On her 55 lbs Cortina. Took me 10 minutes to find this twilight zone beauty locally for €40. And another 30 minutes to pick it up. Cleaned it, set the saddle at the correct height and added a rack from my stash of decommissioned racks (don't like 'em). What am I doing today? realizing hopeful optimism is no substitute for accurate measurements. The replacement fork I got off ebay was 2 cm longer in the steer tube than the original but the threaded section is the same 3 cm length for both meaning I don't have the threads needed to snug up the headset. Sigh. Davidson or Rodrigez should be able to help. Thanks - I had the same thought - Here is the response I got from Davidson in response to my question about adding threads. $200-250. So if it's a restoration of a valuable bike that might be right to do. If not the case, start over more carefully. I've successfully extended the threads on two steerer tubes. I added ~3/4" to a bike of my own and ~1/4" for the owner of my LBS. I used a VAR 40B tool that I purchased from a shop that was closing. The 3/4" project took me about 15 minutes to complete and the extra threads on both steerers blended in perfectly with the original threading. I would encourage you to keep looking for someone willing to take on the job. @Dfrost may have some input as well. Alright, well I don't think it can hurt to try and thread the fork some more if it can be done without causing any harm. If it doesn't work out its below the normal level and could be ok. That will depend on the craftsman. I know fork threads are tricky so if Mark doesn't want to take it on you may be stuck. If'n it was me I would figure it out for myself, good bad or ugly, as a lifelong mechanic/technician I have fixed and saved most of the threaded debacles I have encountered but that's just me. Been very lucky on many occasions without a doubt. Many places will not thread a steerer with a manual tool. The claim is that steerers are threaded on a lathe (true statement for new steerers), and you'll wear out the cutting tool. I thought this was the gospel, never cut the threads using a threading tool. The people that go to this church claim the manual tools are for chasing threads, not cutting new ones. Then I took the UBI framebuilding class, and found that my frame and fork design required a longer threaded steerer than they had in stock. The head instructor found a longer threaded one, handed me the Park threading tool, and told me to have at it. The smallest details helps me see the big picture. New O rings for the record calipers. Thanks Man have fork will Travel I will PM you. There you go, had a feeling Mark would step in. @ryansu Gugie is right. I have cut steerer threads with a die and it works fine. It works especially well if you already have some pre-existing threads to start the die down - this keeps the die straight and square with the steerer when it starts doing real cutting. The dies are made of tool steel which is quite a bit harder than the alloy steels nice forks are made. Any claims that threads can't be cut with a die is nonsense. Yes, if you are working under very tight tolerances in a machine shop, a lathe will always cut cleaner threads, but that tight of a tolerance is not even close to being needed for steerer threads. The only time to be careful with a die is with chrome-plated steerers. The chrome is very hard and might dull the die a bit, depending on the die. Put either the die or the fork in a vise and make sure you have good leverage on whichever is not clamped down. Very meticulous restoration. Can't wait to see the finished product! @merziac, I am amazed that you remembered that I was involved in a steerer tube threading project! When I asked Elliott Bay Cycles to extend the treads on a replacement fork with a very long steerer tube, they said said they’d only add 1/2” maximum, while I was looking for much more (it was really long steerer, and I was putting it in a 60cm frame). I eventually found a shop that would do it with a die. It wasn’t a difficult process. @ryansu, the shop that did that extension was Alki Bike & Board, just up the street from you. But I also think @gugie would do a better job with appropriate cutting oil, etc. 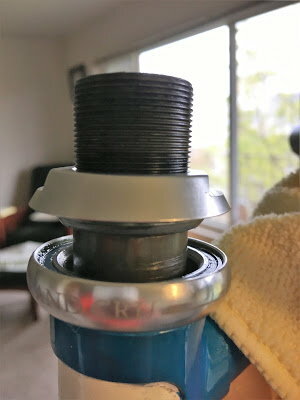 However, I’ve learned why Elliott Bay would limit the thread extension - the stem expander puts high internal radial stresses on the steerer tube, and a conical-style expander concentrates those stresses in one a short length of the steerer. Imagine if that’s happening in the threaded, hence weakened, section of a steerer. I’m pretty sure that’s what happened to the steerer tube on @RiddleOfSteel’s ‘74 Paramount before his rescue and @gugie’s incredible fix. The steerer tube was broken just above the start of the threading, well below the top of the head tube. 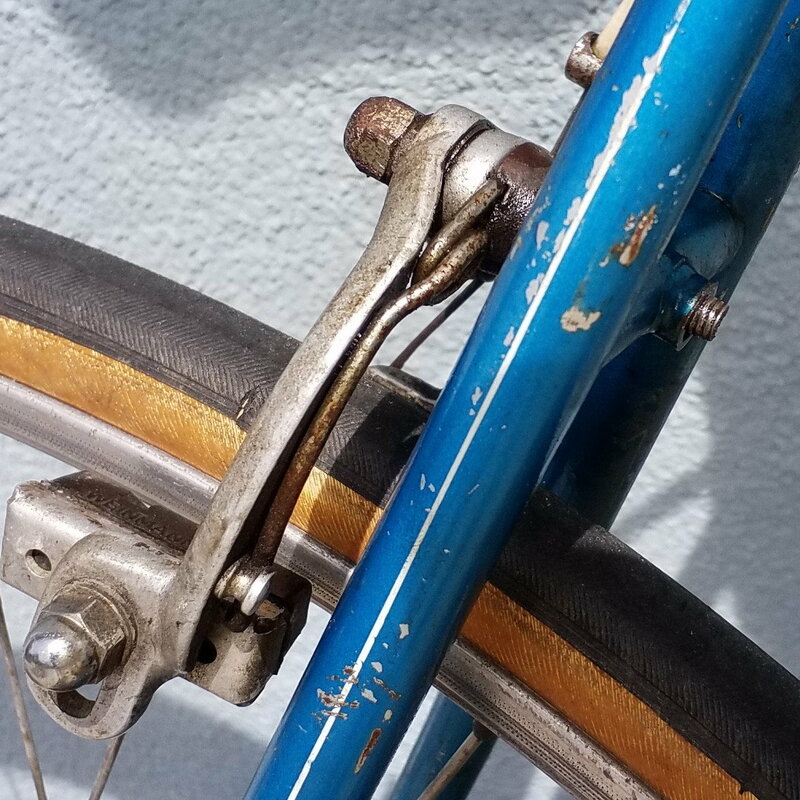 BTW, a wedge-style expander has the advantage of spreading the radial stress over a length of the steerer. So if you do proceed with this fork with extended threads, it sure seems like a very long quill stem, such as the ever-popular Nitto Technomic, would be highly advisable, with a modified minimum insertion that keeps the expander wedge below any threads. Me too but it'll be a few weeks before its done. A few pieces have yet to arrive. Well to be honest, the first connect was geographic, couple that with your vast experience including this particular dilemma and knowing Dan and him had already worked with Mark, thought you would be able to help as well. Looks like Mark has stepped in as expected and you have added your expertise as well, all good, win, win.